A surprising change of course - that contradicts semi-official statements from only two months ago - in Chinese forex policy may bolster US treasury debt for a while. According to a front page report of chinadaily.com Chinese economists recognize the dire state of US financial affairs that root in the reckless spending spree during the reign of George Bush. But having become the biggest holder of US debt as of September 2008 China apparently also accepts the fact that a premature exit out of its $585 billion stash of Treasury paper would unsettle the shaken financial world to a degree nobody wants to ponder about. The report hints that China will remain a good bidder in future Treasury auctions, at these times certainly a more stabilizing act than what is coming from the US Treasury itself. With a $43.6 billion increase in holdings of US treasury securities in September, China's overall holdings amounted to $585 billion. Japan cut its holdings to $573 billion from $586 billion in August. Net foreign purchases of long-term US securities totaled $66.2 billion in September, up from $21 billion in August and $18.4 billion in July. Treasury data suggests that foreign investors still regard the US as a relatively better place to invest when markets worldwide are crumbling, analysts said. "That's why China has increased its holdings," said Dong Yuping, senior economist at the Institute of Finance and Banking affiliated to the Chinese Academy of Social Sciences. Not all economists are of the opinion that China should help to blow up the US debt bubble. For the past decade China has increasingly bought US debt that helped finance its own Wirtschaftswunder based on enormous export growth that made it the biggest contributor to the US trade and current account deficit. As the US financial crisis worsens, Washington is in dire need of capital to fund its massive market rescue plan; but some domestic economists argue that China should not use its foreign exchange reserves to purchase US bonds for fear that it may incur huge losses. "But China may not have many options," Dong said. The US economy, though hemorrhaging from the crisis, remains the largest and strongest; and the EU and Japan are not yet a serious challenge to US pre-eminence. Investment in dollar assets, therefore, carries the least risk, he said. If China reduces its holdings of US debt, others may follow suit, which will lead to a weakening of the dollar and depreciation of dollar-denominated assets, thus severely hurting China's interests. "China and the US are in the same boat," he said. "You may not like it, but China has to move along this path," said Yan Qifa, senior economist with the Export-Import Bank of China. 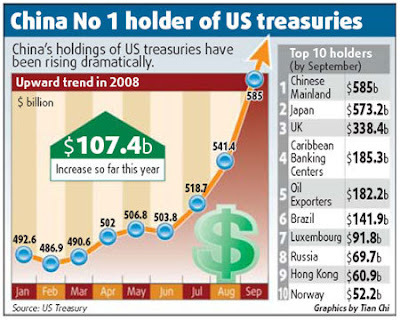 And now that many countries are increasing holdings of US treasury bonds, China's potential returns from the bonds will increase, said Chen Gong, chief economist and chairman of Anbound Group, a Beijing-based consulting firm. "So China may continue to increase its holdings," he said. However, some experts argue that Beijing use its considerable financial leverage to set conditions such as the US opening its financial markets more to Chinese funds, and allowing exports of high-tech products to China. China faces the same problem every holder of US debt has: As the Bush regime has roughly doubled US debt to more than $11 TRILLION in a mere 8 years, more than all 42 previous presidents before in 224 years, the value of FRNs depends increasingly on the belief that America will somehow manage to escape a serious depression that is boldly written on the wall. Right now the relative strength of FRNs stems to a good dose from even worse conditions for the Euro and the Pound. I think it is safe to say that all 3 will fail as all unbacked fiat currencies before. It is only a matter of time, as it has always been. UPDATE: Find all current developments in the bond market over at Across The Curve.